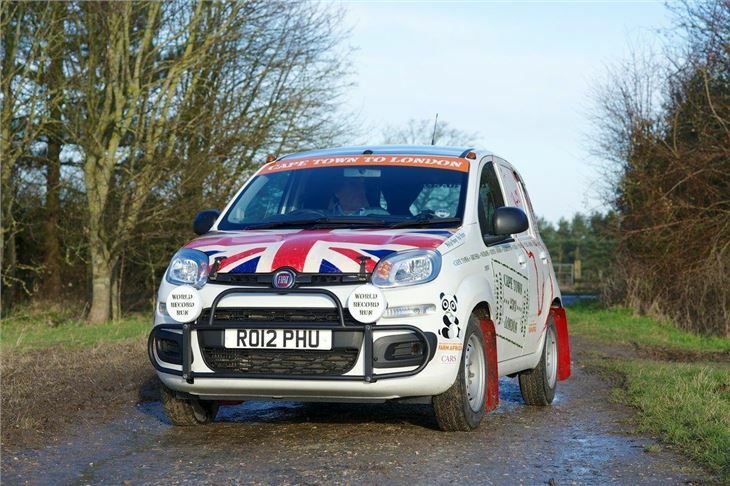 Philip Young's brave attempt to break the driving record for Cape Town to London in a Fiat Panda is getting closer to the off. 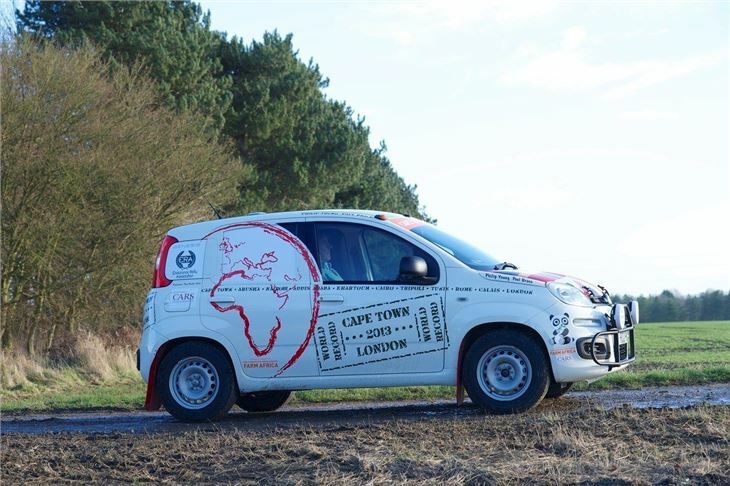 The car is now en route to Africa, ready for the 1 February start. What's it all about? 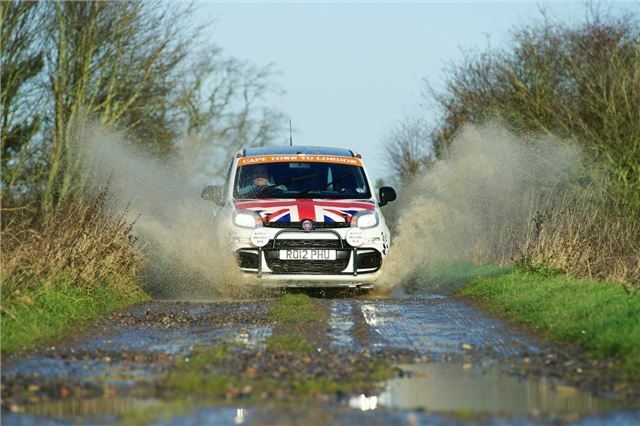 The challenge is whether a Fiat Panda TwinAir, powered by one of the smallest engines you can drive out of a UK showroom, can beat the record that has stood for 30 years, set by the British Army in a factory-prepared Range Rover, as the best time from Cape Town to London. 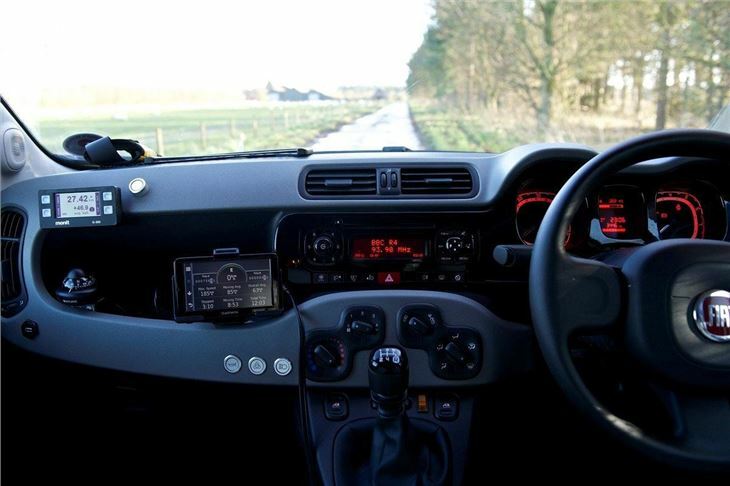 It means driving 1000 miles a day non-stop if the ultimate record time is to be broken. That's the target of Philip Young and Paul Brace, who have a five inch thick mattress from Mothercare in the back of the Panda to sleep on when not driving, and a large funnel, for the obligatory 'calls of nature', spares are limited to a throttle cable along with a roll of gaffa tape and tube of super-glue, the crew have one spare pair of charcoal-lined underpants and a couple of T-shirts, which might last the trip providing border guards dont help themselves first. 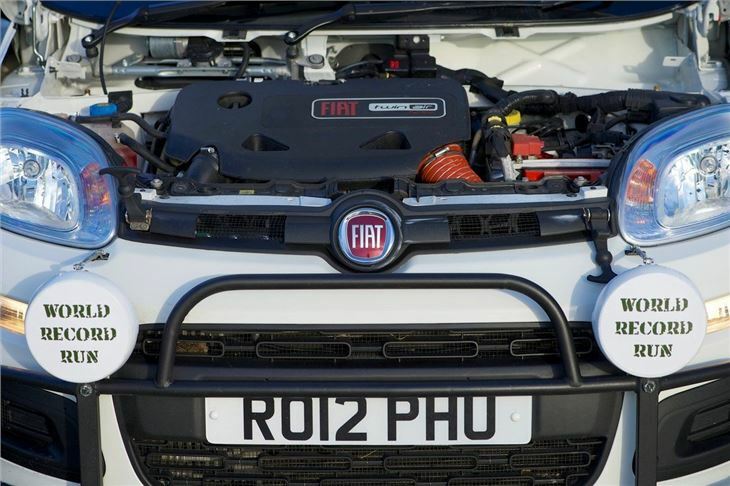 The car has had 500 hours of preparation in the hands of experts at Tony Fowkes Autos in North London, other than that, its exactly as it drove out of the showroom of Fiat dealers, Mellors of Wantage, in Oxfordshire, who sold Young the car for £10,500. 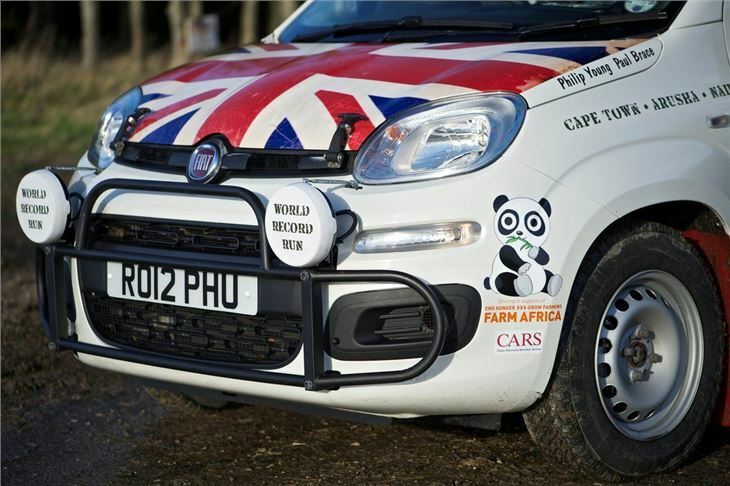 The Panda is now on a cargo ship to Cape Town - if it gets back to London's Marble Arch and meets Mayor Borris Johnson, it could become the world's most famous Panda, as well as going down as the one that can beat a Range Rover across two Continents. In preparing for the event, the team had to jet off to Livingstone when he heard that the ferry over the Zambezi isn't running... Philip Young has been promised it's a mere temporary hitch and soon the pontoon will be crossing from Botswana to Zambia again, once they have fixed the head gasket. You either cross by raft (nice idea - but slow as you need a lot of paddlers and there is always a risk of a Panda mixing it with the crocodiles) or, go by pontoon.. the river is over half a mile wide at the Kalunguza bend in the river, just upstream from the rapids that tumble down the world's biggest water fall at Victoria Falls. Even the pontoon is not exactly gauranteed safe. It's turned upside down now and then, once throwing 17 passengers to their deaths, either drowning slowly or eaten quickly by the crocs. You can learn more about the record attempt at www.africarecordrun.com, and we'll be following the progress of the team, both before and during the ambitious run. I wonder if I might comment on this most interesting article on Philip Young's attempt on the Capetown to London driving record. I had lunch with Philip a couple of months ago and he outlined his plans which certainly sound very exciting; indeed he is off shortly and we have just written to wish him good luck with his venture. May I, however, just pick you up on one fact (for the other sort of record) - the vehicle my wife and I drove in 1983 was not an Army vehicle nor was it associated, sponsored or supported by the Army in any way. It just happened that I was still serving at that time but I took annual leave to do the trip. There is one other point as well; in order to qualify for the full record it has to be overland all the way, with no sea or air sections (other, of course, than the English Channel), or ferries down the Nile. Also all stops are reckoned as force majeur and therefore counted into the overall total time. We have always been given to understand that our drive in 1983 was actually the first ever to do the whole trip overland. Previous attempts had always either crossed the Mediterranean or used a Nile ferry between Juba and Kosti, Atbara, or Wadi Halfa.